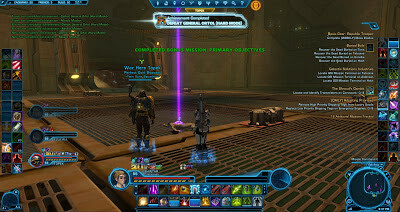 Going Commando | A SWTOR Fan Blog: Achievement! Supposedly the vast majority of MMO players are achievers according to the Bartle Test. I feel rather like a special snowflake sometimes, considering that the last time I took it, I scored Explorer > Socialiser > Killer > Achiever myself. Yes, I care less about actually achieving things in game than pretty much anything else. I don't completely loathe achievement-oriented game play or anything, but it never manages to stay my priority for long. With that in mind, it shouldn't surprise anyone that I'm not a big fan of achievement systems either, even though I know that a lot of players love them. From my point of view they detract from actual in-game achievements (such as overcoming a challenge) by shifting the focus onto a badge-collecting meta-game; they can be abused as a cheap replacement for actual content (instead of giving players a new dungeon, let's give them five new badges for running the old one clockwise, counter-clockwise, with nobody dying, in less than half an hour etc. ); and sometimes they even outright encourage bad play. It's funny how many WoW pundits considered Ulduar's hard modes one of the game's high points for example, while I vividly remember loathing them for the way they encouraged our raid to "play stupidly" (by not killing bothersome adds or ignoring key mechanics of a fight) just to get another badge. 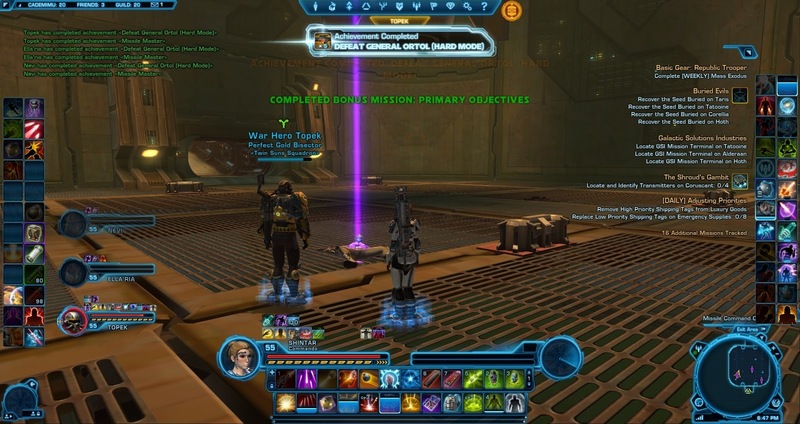 Sooo... when SWTOR introduced an achievement system with 2.0, I was not thrilled and said as much. However, one and a half months into the expansion, now that I've actually had a chance to see it live... I have to confess that it hasn't been nearly as bad as I thought it was going to be. Sometimes it's the little things: for example I like the fact that the achievements pop up near the top of my screen instead of at the bottom (like they do in WoW), where they would always cover part of my character. It feels less "in your face" and like I can choose to ignore them if I want. I genuinely appreciate that. In the post that I linked above I also kind of mocked SWTOR's achievement system for being pretty dull ("run each flashpoint twenty-five times, kill a thousand mobs on each planet, kill a hundred mobs with each companion out") and joked about how max-level characters would just roam around the lowbie planets to mow down low-level mobs en masse. While I have observed some people engaging in that kind of behaviour (my guild leader and his favourite minion turned into terrors of Tython during early access, ninjaing the poor lowbies' training droids over and over again just to rack up numbers), it hasn't been nearly as prevalent as I expected it to be. I've also enjoyed killing random champion mobs around the galaxy for a long time now, and unsurprisingly an achievement has been added for that as well. I'm not thrilled about the added competition from players who will now hunt them down specifically "just to get the achievement", but it's been interesting to see a whole in-game list of champions for each planet and realise how many of them I've never even run into. Can't complain about being given some more encouragement to explore I guess! I just hope that they don't decide to go overboard with the sillier achievements (the other day a guildie was ranting about having to set Makrin on fire on Makeb or something, which sounded kind of pointless to be honest)... and that they work hard on ironing out the bugs that are currently still plaguing the system. On release almost none of the PvP achievements worked as intended for example, as they all required you to hit exactly x damage, y healing or z kills (instead of "at least that much or more"), which pretty much never happens and made the damn things nigh impossible to get. This has been fixed since then, but a lot of the operations ones are still broken, either because they award the wrong badge (my favourite was my significant other receiving "survived Karagga on nightmare" from killing Fabricator on story; that was just random) or simply don't give credit at all (like the third and fourth encounter in EV). I think I now know why we get along. I just took the test and scored Explorer > Socializer > Killer > Achiever too! Neverwinter has a similar achievement system to TOR, and I didn't realize it until I killed some baddie and all of a sudden "POP!" there it was. I'm kind of meh about it, since the only achievement I really cared about was Loremaster when it was hard to get, and the Loremaster achieve kind of feeds the Explorer mantra anyway. Still, it seems enough people are happy with it. At least TOR hasn't made achieves account-wide. I noticed the Neverwinter thing when I got items like "Ogre Slayer I" popping up, but I've never even looked at the achievement UI there (if there is one). And aaah, Loremaster. I used to call it the achievement "that really does feels like an achievement", heh. Of course, it's now a lot easier to get once they remade the Old World. Hunting down those last 2-3 quests on Eastern Kingdoms and Kalimdor used to take forever. I didn't think much about the achievement system beyond a small addition. Since there aren't any rewards, I just think "oh cool, I completed an achievement" without being conscious about being busy with one. That said, I don't know how much I score as Achiever with that test (probably not that high). @Redbeard, Where can I take that test? I just redid it myself and apparently my social side has overtaken my explorer side since last time! Not that I'm surprised really. However, I still maintain that Ulduar was the absolute pinnacle of raiding and no small part of that lies with the hard mode / achievement system. I also don’t think that there is only one right way to complete an encounter. Concerning the Bartle-Test: I will have to investigate this matter a bit closer, but at first sight the test doesn't seem to be very scientific and also doesn’t strike me as very well thought-through. My “score” is EASK (80/40/40/40). I didn't actually dislike Ulduar, but I really had very mixed feelings about it. I wrote about the subject in detail back in WOTLK here.